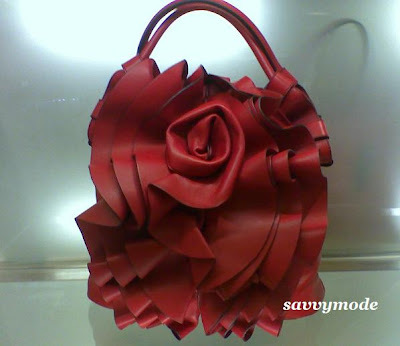 Savvy Mode: Valentino Rouches Napa Ruffle Hobo, Too Much of a Good Thing??? 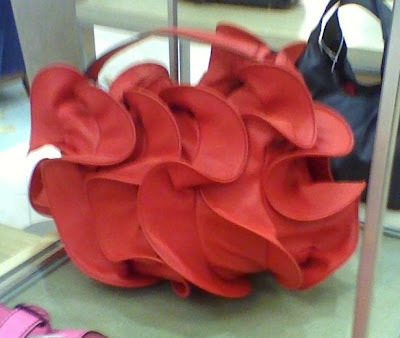 Valentino Rouches Napa Ruffle Hobo, Too Much of a Good Thing??? Mr. Valentino, I have a love/hate relationship with this ruffle bag. On the one hand, I adore ruffle. But, there is just so much ruffle it is distracting. My first impression when I saw the bag was oh-my-it-is-so-puffy. I admit there are lots of tissues inside but it is still all too ruffled for my taste. I can see this is a statement sculptural piece that is supposed to standout. But, I don't have the urge to hug it to me and provide a home in my closet. This bag has an inside zip and two open pockets and measures 13 1/2"H x 15"W x 8 1/2"D. You can take it home for $2595. If I am to buy a statement ruffled piece, I would pick the Valentino Rose Vertigo for $2395 instead. What do you think? *Don't forget to enter giveaway here. I love the color, the red is so gorgeous. Most definitely a conversational piece, but beautiful in its own right. I prefer the 2nd one. It's a bit much but I think with a LBD it would be the statement piece! Actually, I'm over all the ruffles. From the Valentino to the tacky Steve Madden bags to the Big Buddha bags. Enough with the ruffles. They should be on shirts or clutches, not purses - IMHO. I love the rose purse better, so beautiful! I think you could rock it! I love the rose bag. That would be my choice too. Hmmm... I like ruffle detailing, but not ruffles over the entire thing. My vote is for the rose bag, because the layers there form to make a rose, whereas the ruffles on the ruffle bag are just a big mess, lol. I actually like the first one better because I like the size and also I don't really like the floral touch that the second bag has. Very unique but I think it's over ruffly. Or maybe that's just me. welllllllllllllll.......they are both pretty (although a little fussy, and probably distract from any outfit one could wear with them), but awfully trendy. i am afraid the ruffle obsession thing will fade fairly soon, and one will be stuck with a very expensive bag that might look outdated quickly. eventually it will come back in style, though. I'd pick that Rose Vertigo bag as well. The other one just looks weird! i would pick the rose vertigo bag, the ruffles aren't nearly as overwhelming as the first one! yea the first bag is a big toooo ruffly. the 2nd one is better. You know, I love the idea and look of the Valentino bags but I just don't think they work in real life. I definitely prefer the second one. Both are pretty! I actually kind of prefer the first bag myself - there's something about the soft waves that I really like. However, if I were to see it in person, maybe it would seem a bit too "puffy" or voluminous.